Lucy Adams Houghton married Hamlet Clinton Bellows in Nov 16, 1859 at Brattleboro, Windham Co., VT, USA, age 18; his second. 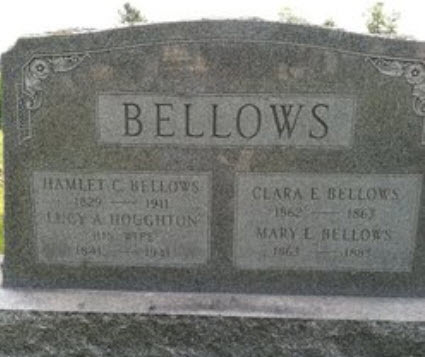 Hamlet Clinton Bellows married Lucy Adams Houghton, daughter of Capt. Bradley Houghton and Eliza Rutter, in Nov 16, 1859 at Brattleboro, Windham Co., VT, USA, age 18; his second. Eliza Jane Houghton married Everton Wells Winchester in Dec 12, 1865 at Brattleboro, Windham Co., VT, USA, Eliza Houghton of Marlboro. Jeanette Cordelia Houghton married Nelson H. Pierce in Apr 16, 1885 at Grafton, VT, USA, age 32. Janette Martha Johnson married Bradley Houghton Jr., son of Capt. Bradley Houghton and Lucy Adams, in Jan 2, 1871 at Marlboro, Windham Co., VT, USA, he age 35, 2nd. Calvin Houghton married Charlotte Stark in 1812. Charlotte Stark married Calvin Houghton, son of Philemon Houghton and Mary Packard, in 1812. Sophia Houghton married Samuel Dennison in Dec 4, 1808 at Marlboro, Windham Co., VT, USA, p. 189, Sep. 1811; by Rev. G. C. Lyman. Samuel Dennison married Sophia Houghton, daughter of Philemon Houghton and Mary Packard, in Dec 4, 1808 at Marlboro, Windham Co., VT, USA, p. 189, Sep. 1811; by Rev. G. C. Lyman. Betsey Houghton married Harvey Halladay in Sep 17, 1815 at Marlboro, Windham Co., VT, USA, Ramona Wickenkamp: Sep. 17, 1815; Marlborough VT Hx: Oct 1815. Harvey Halladay married Betsey Houghton, daughter of Philemon Houghton and Mary Packard, in Sep 17, 1815 at Marlboro, Windham Co., VT, USA, Ramona Wickenkamp: Sep. 17, 1815; Marlborough VT Hx: Oct 1815. 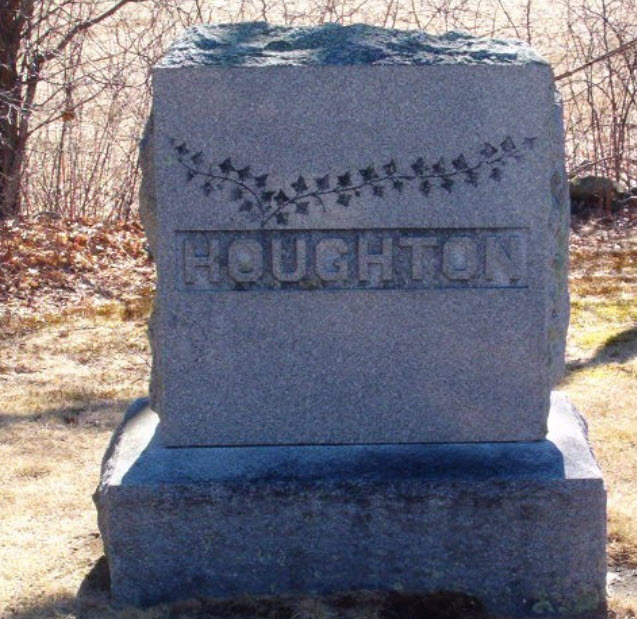 Lucy Houghton married Ezra Hatch in Jan 20, 1819 at Marlboro, Windham Co., VT, USA. Lucy Houghton married Nathaniel Whitney Jr., son of Capt. Nathaniel Whitney and Molly Houghton, in Nov 30, 1848 at Marlboro, Windham Co., VT, USA. Ezra Hatch married Lucy Houghton, daughter of Philemon Houghton and Mary Packard, in Jan 20, 1819 at Marlboro, Windham Co., VT, USA. Sarah P. Smith married Emory Houghton, son of Philemon Houghton and Mary Packard, in Mar 20, 1827. 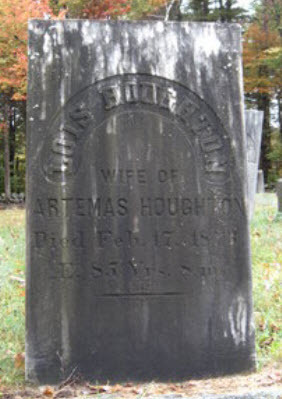 Laura Houghton married Jonas Haven in Feb 10, 1828 at Wilmington, Windham Co., VT, USA, Bowen: Feb. 1833. Lois Mather married Artemas Houghton, son of Capt. Nahum Houghton and Lovisa Howe, in Oct 7, 1810 at Marlboro, Windham Co., VT, USA. Almon Ballou married Sally Towne Houghton, daughter of Artemas Houghton and Lois Mather, in Jun, 1840. Willard Bixby married Lois Mather Houghton, daughter of Artemas Houghton and Lois Mather. 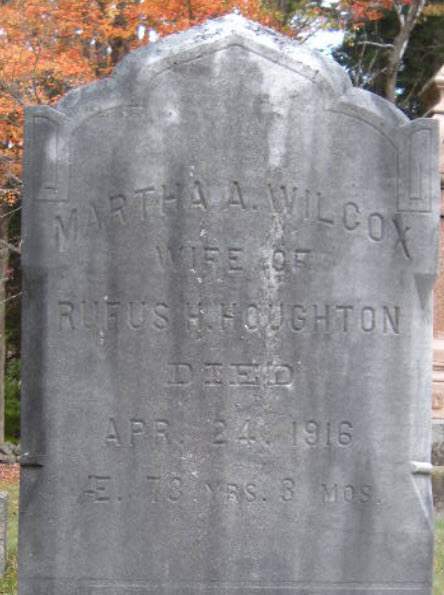 Martha Ann Wilcox married Rufus Henry Houghton, son of Artemas Houghton and Lois Mather, in Oct 15, 1860 at Brattleboro, Windham Co., VT, USA, age 26. Sarah Adams married Cotton Mather Houghton, son of Artemas Houghton and Lois Mather, in Jun, 1852 at Marlboro, Windham Co., VT, USA. Theodocia A. Morgan married Cotton Mather Houghton, son of Artemas Houghton and Lois Mather, in Oct 6, 1857 at Brattleboro, Windham Co., VT, USA, age 30. Death Mar 26, 1858 Marlboro, Windham Co., VT, USA, aged 5 yrs and 8 mos. Simeon Houghton Adams married Doris Baker in Jan 1, 1846. Simeon Houghton Adams married Esther Lucinda Knight in May 10, 1848.